Found on the street: a dish washer. May 3rd: I receive my Bastiaen Cargo (Nr.3) at Düsseldorf main station. 21:00 pm, Bochum station, my first ride, just 15m later I´ve got the knack. 8 km homewards are a good practice. I use the bastiaen ever since for commuting (18 km) and all other errands about 25 km/day. It does not like curbs higher than 7 - 8 cm (and no steps as well) but that is not what it has been designed for. The racing tires reduce offroad performance and I am going to change to bigger tires as soon as the Kojaks are worn through. Nr. 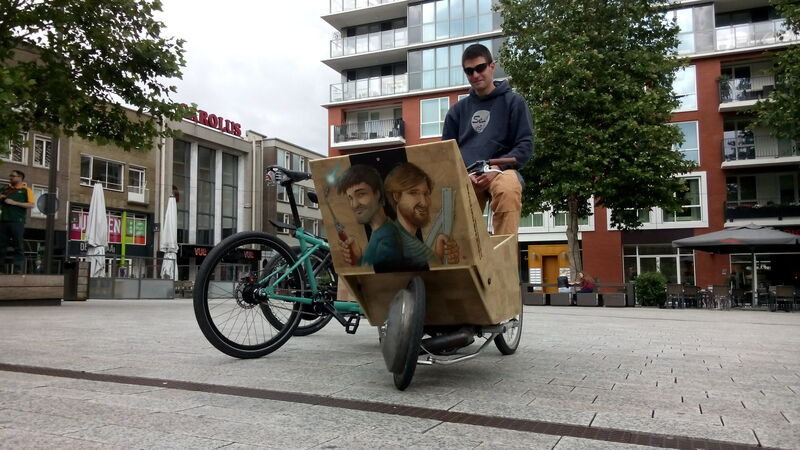 3 is a cargobike and that´s why I have it. I exchanged the sandwich scoop for an 18mm multiplex board, because I wanted to add tough eyebolts to secure my cargo. Everyday-loads of 20 - 30 kg are no problem at all, 80 kg only uphill (smoker that I am). "Can you get me some wood?" "Spruce 8 x 10 x 400"
"No, cm. They don´t fit in my VW Van"
A rear luggage rack with "gallows" added on the right side helps to carry long cargo: drop it on the flatbed and hang it from the gallows in the rear. A timber 8x10x400 is no problem, with two such timbers too much weight is off center. 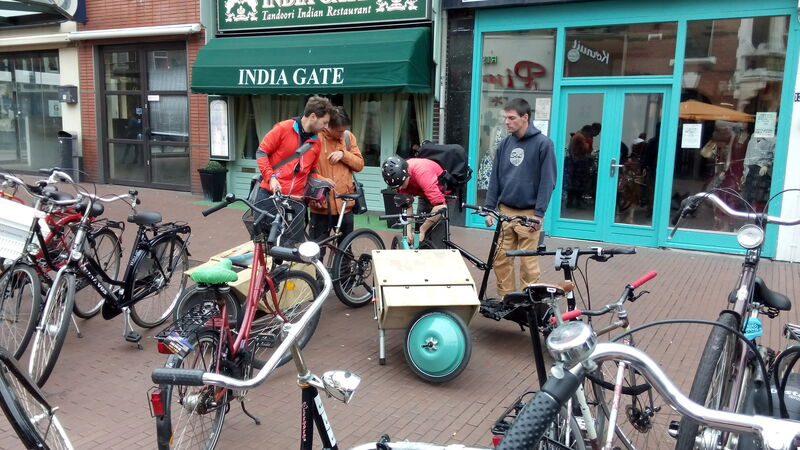 All friends (most of them without any experience with cargobikes) could ride the bike after 10 to 20 m without any issue. One lady immediately picked up 60kg from the DIY market and returned unscathed. I don´t regret buying the Bastiaen. This is my bike! 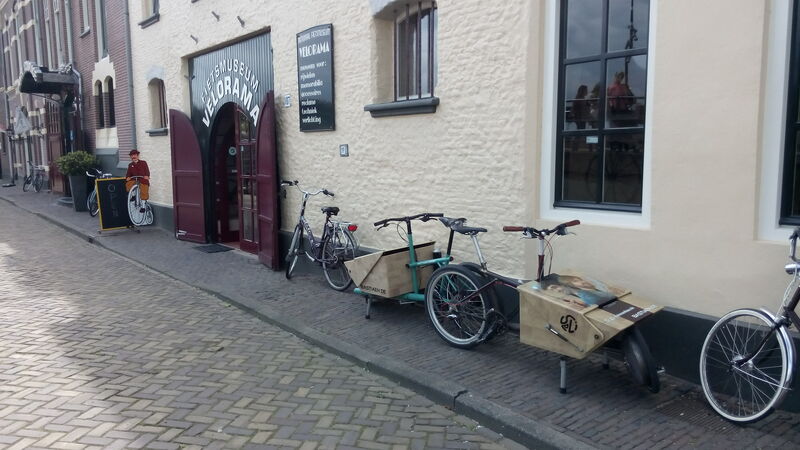 We spent a couple of relaxed days at the cargobikefestival in Nijmegen. Sebi had to cover sunday alone with his #6 but I managed to join him in time for an informal rideout on monday with #2. Finally on monday evening we were joined by our cargoracer #8. Jakob, who kindly agreed to bring the bike from Berlin cargobikerace to Nijmegen was chucked out of the train which treated him to a nightly bike ride back home on the Bastiaen Cargo and he seemed quite delighted. 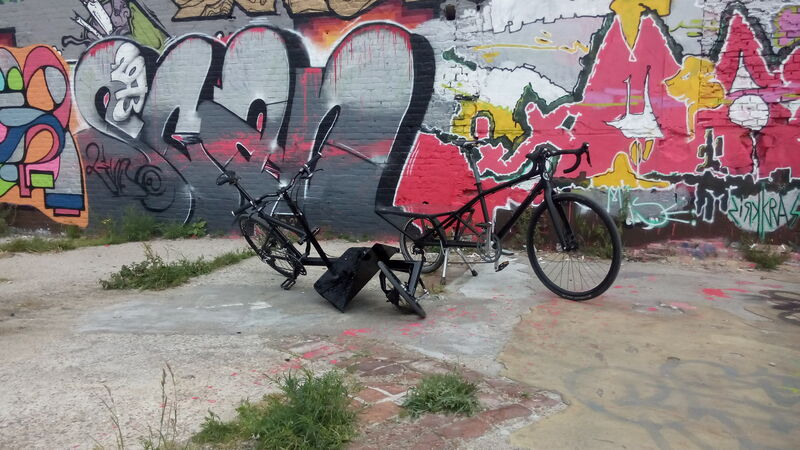 We spend the morning with a joint foto session with Diego Brunellos Alpacargo (don´t those two bikes look like from the same stable?) and then went out for dinner. Sunday began with a visit of Velorama bike museum (inspiration for the future and a deep bow before the ancestors achievements!) and ended with a shockig ride on a chinese rear-steering tricycle. Actually it rode surprisingly well but - being a sailor - I understood the rear wheel as a rudder and kept steering wrong direction because the handlebar is not a tiller. 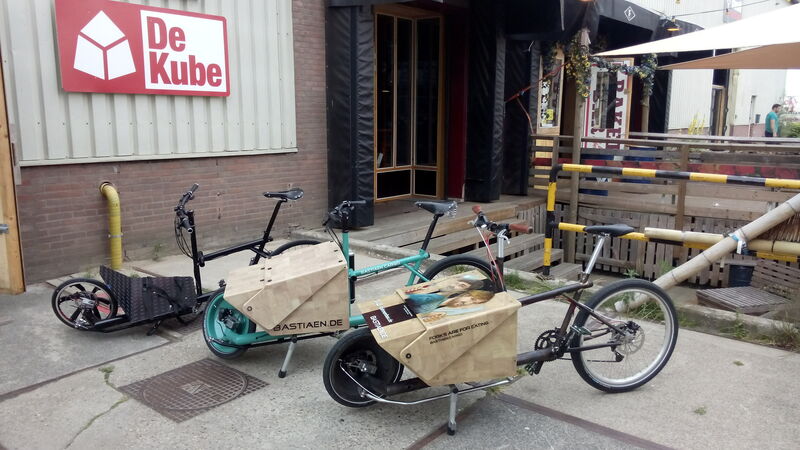 Meet us at Cargobike Berlin on Sat., June 10th and the Internationalen Cargobikefestival Nijmegen on Sun., June 11th to Tue., June 13th. WE NEED YOUR HELP! Please get in touch if you can transport Bastiaen Cargo no.8 from Berlin to Nijmegen on June 10th or from Münster to Nijmegen on June 11th. Our incentive for you: pilot our black racer in the races at Berlin and Nijmegen! The Bastiaen cargo fits exactly in the vertical bike holders in the Intercity train. So travel by train is easily possible. We have been on the lookout for a white tire in any 355 size for some time to try how a touch of retro fits the radical design of the Bastiaen Cargo. Now I found this lovely white 47-355 NSK unicycle tire. It seems adequate for cargobike use, but I´ll probably go for a disc wheel in a corresponding RAL5023 "Distant Blue". We are building 10 Bastiaen Cargo´s!